Rabbit anti Human GPER / GPR30. Percent identity with other species by BLAST analysis: Human, Gorilla (100%); Monkey, Marmoset (88%). BLAST analysis of the peptide immunogen showed no homology with other human proteins. 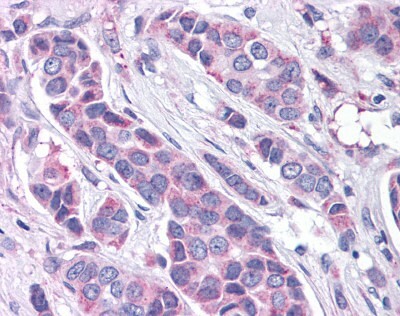 Immunohistochemistry on Paraffin Sections: 20 µg/ml. G-protein coupled estrogen receptor that binds to 17-beta-estradiol (E2) with high affinity, leading to rapid and transient activation of numerous intracellular signaling pathways. Stimulates cAMP production, calcium mobilization and tyrosine kinase Src inducing the release of heparin-bound epidermal growth factor (HB-EGF) and subsequent transactivation of the epidermal growth factor receptor (EGFR), activating downstream signaling pathways such as PI3K/Akt and ERK/MAPK. Rat GPR30 is also known as GPR41 and HIA-R.
1. Chen ZJ, Wei W, Jiang GM, Liu H, Wei WD, Yang X, et al. Activation of GPER suppresses epithelial mesenchymal transition of triple negative breast cancer cells via NF-κB signals. Mol Oncol. 2016 Jan 18. pii: S1574-7891(16)00012-0. doi: 10.1016/j.molonc.2016.01.002. PubMed PMID: 26842883. 2. 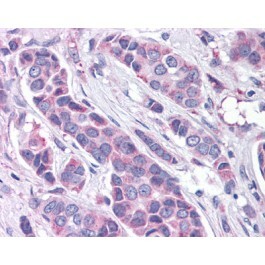 Weissenborn, C;Ignatov, T;Nass, N;Kalinski, T;Costa, SD;Zenclussen, AC;Ignatov, A. GPER Promoter Methylation Controls GPER Expression in Breast Cancer Patients. Cancer Invest 2017, 1-8. PubMed PMID: 28118074. 3. Liu, Q;Chen, Z;Jiang, G;Zhou, Y;Yang, X;Huang, H;Liu, H;Du, J;Wang, H. Epigenetic down regulation of G protein-coupled estrogen receptor (GPER) functions as a tumor suppressor in colorectal cancer.Mol. Cancer 2017, 87, 16, 1. PubMed PMID: 28476123. Store undiluted at 2-8°C for one month or (in aliquots) at -20°C to -70°C for longer. Human, Gorilla, Monkey, Marmoset (tested or 100% immunogen sequence identity). Reacts with N-terminal extracellular domain of G Protein-Coupled Receptor GPR30 (family: GPCR, subfamily: Transmembrane Estrogen Receptor).